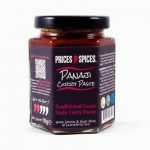 Panaji Curry Paste is very easy to use and offers very authentic flavours. After cooking a simple Madhur Jaffrey curry some years ago we were hooked on fish and seafood curries from southern India. Mr & Mrs Price also took a holiday to the “Off the beaten track” parts of Goa (Panaji / Panjim) in 2005 and came across a restaurant called Hotel Venite. Despite it becoming slightly more touristy these days the prawn curry we had was divine, the prawns were also the size of a toddlers forearm!!! 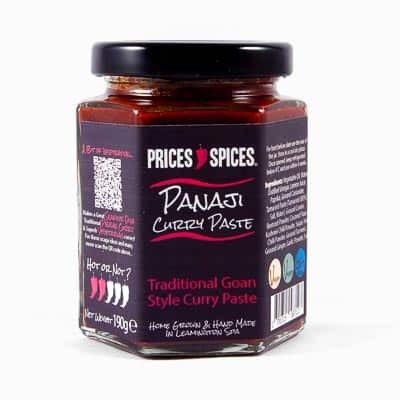 This Panaji Curry Paste is a love for both of these Goan style curries which we’ve spent lots of time tweaking to make into a paste. 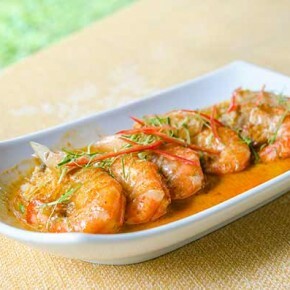 The usual problem with a paste is cooking the ingredients with oil to bring out the aroma and flavour. In doing so though, you often end up with an oily paste. You don’t want this with this style of curry as the oil floating on your curry looks unappetising! We have created a few usage suggestions by means of recipes for you to try out, we’d love to see how your usage ideas differ. If you come up with any usage ideas, that we’ve not thought we’d love to know what they are. 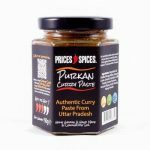 Heck go ahead and submit us a Panaji Curry Paste recipe! 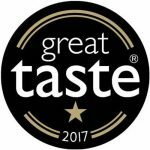 If nothing else we’d love to hear your thoughts and opinions by the way of a review. The jar of Panaji Curry Paste will cook two or three curries. Each one will feed four people. This has to be the fastest curry known to anyone! Not only is it fast, it's also pretty healthy and packed full of flavour too! Water, Vegetable Oil, Distilled Vinegar, Lemon Juice, Paprika, Ground Coriander, Tamarind Paste (Tamarind (80%), Salt, Water), Ground Cumin, Beetroot Powder, Coconut Flour, Kashmiri Chilli Powder, Sugar, Hot Chilli Powder, Ground Turmeric, Ground Ginger, Garlic Powder, Salt. First class sauce went very well with pickled lemons stuffed squid and paratha bread.